Smoke adds flavor to your game! Moose (alces alces) hunting season in Finland this year starts on 13th of October and lasts until 31st of December. Number of mooses hunted varies between 58.000 – 85.000 annually. You can find moose meat on good quality shops for a short period of time. Still, most often the best parts are consumed by hunters or sold directly to existing network of private customers. 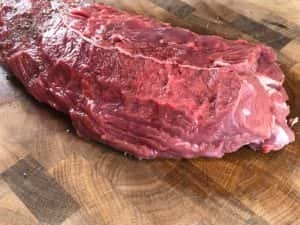 This time I got a hold of 2 ½ lb (1100g) moose sirloin. Venison tends to be very lean and moose is not an exception. When grilled, it should be left medium rare. Target temp for the meat is 140°F (60°C), but you can go as high as 150°F (65°C). Go higher, meat will get tough, dry and chewy. Seasoning is simple. 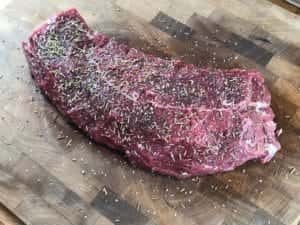 I use kosher salt, black pepper and rosemary. Thyme is also good. Smoke adds nice flavor to venison. I like to use apple or cherry wood and go quite easy. In my opinion, too much smoke kills original venison flavor. I have smoked moose number of times in my Weber Smokey Mountain. Cooking time in 230°F (110°C) was about 2hrs. However, this time I used my Monolith kamado and moose was ready in 1hr. Cooking temp was 265°F (130°C) so you really need a good thermometer to follow the progress. Once cooked, I let the moose sirloin rest in foil for half an hour. As you can see, smoking moose sirloin is much about monitoring temperatures. Good thermometer will make your cooking simple and fun. And bad thermometer will drive you mad, so pay attention to this!